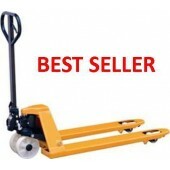 Pallet Trucks are one of the most popular forms of materials handling equipment. They offer an excellent lifting solution for both light and heavy loads. Our range will offer a product which will enable you to lift a standard euro pallet, UK and American pallets as well as pallets from the Far East. 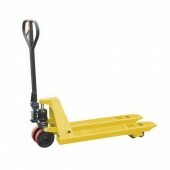 Our selection of Pallet Trucks range from lightweight lifting to heavy duty products lifting up to 5000kg of material. As the UK’s top Pallet Truck Suppliers we are always on hand to offer help and advice to ensure you receive the Pallet Trucks that meet your specification. With our Pallet Trucks and Manual Handling Equipment Service our standard delivery guarantees you to receive your pallet trucks within 3 – 4 working days. 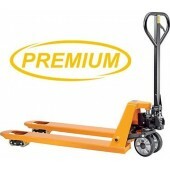 We offer a 2 year pump guarantee with every Pallet Truck and Hydraulic Stacker we supply. Our German manufactured pump units are built to be strong and robust to cope with all sorts of loads. If you do encounter a fault we will arrange collection, repair and re-delivery of your pallet truck within 48 hours. Our entire materials handling equipment range comes with this promise to ensure you are 100% satisfied with the service you receive. 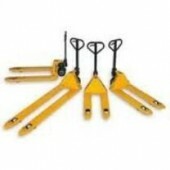 Pallet Trucks There are 88 products. Our range of wide pallet trucks offer great versatility as well as the promise of maximum stability of your carried load. 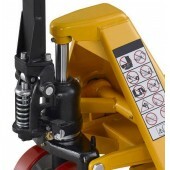 All our Scissor Lift Pallet Trucks come with top quality hydraulic pump with a slow lowering hand control, 3 position lever, providing fingertip control.These trucks lift to a maximum working height of 800mm and have stabilisers that keep the truck in its working position once you have pumped it up to a suitable working height for operator safety. 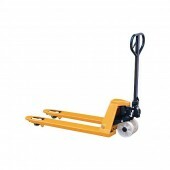 This special purpose range of Low Profile Pallet Trucks is designed to operate with low clearance pallets and disposable pallets which are increasingly common in containers which have been loaded by conventional forklifts. Available with 35mm and 51mm lowered height ! 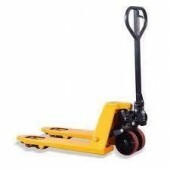 All our Extra Long Pallet Trucks come with top quality hydraulic pump with a slow lowering hand control, 3 position lever, providing fingertip control.This Pallet Truck is supplied with Tandem Load Rollers which help spread the load on the floor surface and thus reduce's ground contact loading by 50%. This makes it easier to move heavier loads on the pallet truck resulting in less effort / strain for the operator. Our Galvanised Pallet Trucks receive a Galvanising process that gives durable corrosion protection, that stands up to the constant abrasion of pallet entry and exit. Fully galvanised mainframe, wheel forks, brackets, push rods and handle. Fully sealed hydraulic nickle coated pump Pressure relief valve Three position handle-Lift-Neutral-Lower Tandem nylon load rollers & steering wheels Our Stainless Steel Pallet Trucks have parts which are all Stainless Steel including the hydraulic pump, fork frame, handle, push rod, Bearing, pin and bolt,etc For use in meat and other food industries, dairy canning and areas where corrosive acids and saline solutions are used. Fully sealed hydraulic coated pump with pressure relief valve/overload valve. 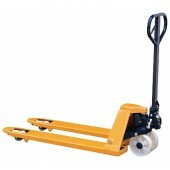 Three position handle-Lift-Neutral-Lower Tandem nylon load rollers & steering wheels. Our range of Mini Pallet Trucks are easy to manoeuvre when in restricted places such as narrow isles and with in the back of vehicles. 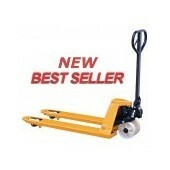 The mini pallet trucks are widely used in the printers industry therefore can also be named printers pallet trucks. All the range of mini tucks have twin tandem load rollers and 2500kg robust load capacity lifted by German designed pump and supplied with Full 12 months parts and labour warranty. 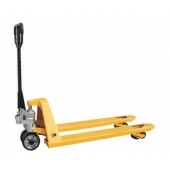 Our Rough Terrain Pallet Truck has been designed to travel over ground where ordinary pallet trucks have difficulty. It is suitable for Nurseries, Builders Yards and out on site. This offers an affordable solution to problems of handling palletised goods over difficult terrain.